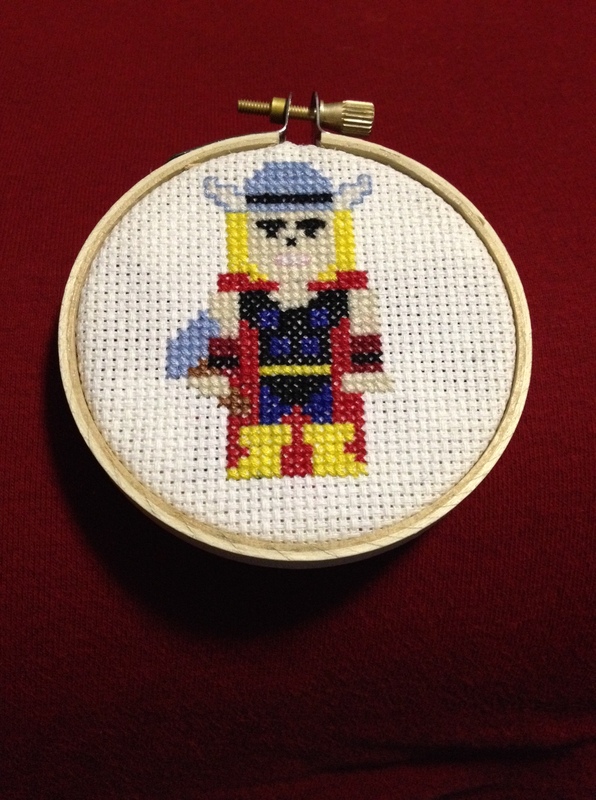 As I mentioned previously, I made a bunch of smaller cross-stitch projects as presents for various folks for the holidays. My partner’s littlest sister (she’s 20, but still the littlest one of the family) is a big fan of the Avengers. But I’d already done the Avengers logo for my friend, and I wanted a new pattern. I get bored easily, what can I say. I decided to focus on one of the Avengers solo instead, and after narrowing down to her two favorite Avengers (after some intense Facebook-stalking), I chose Thor. I found a pattern on Pinterest for making the Avengers out of post-it notes that I thought would easily translate into cross-stitch. And it did! Adorably so, if I do say so myself. That is ridiculously cute! I don’t actually cross stitch (I crochet and knit) but now I kind of want to. Thank you! I learned to cross-stitch when I was little and abandoned it because I thought all the patterns were Grandma-esque. I discovered a couple years ago that our generation is starting to create really cool patterns (a lot out of pixel art) and calling it stitchpunk, and I was hooked! I wish I could knit. I tried and never was able to get beyond a simple scarf. I’m hoping to learn crocheting one day! I love it! I love the colors! I’d hang it on my wall, and I’m old! Oh my, that’s very high praise! Thank you, Amanda! Wow, from post-its to cross stitch – clever! Great job!